The Little House stories are classics of children's literature, beloved by millions. 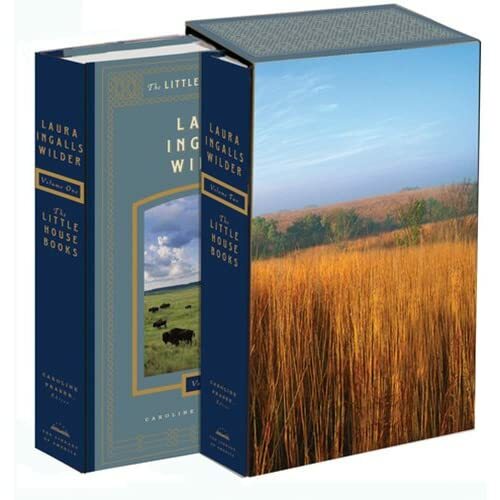 Now, The Library of America presents this definitive boxed set, reintroducing these enduring works to readers young and old. Here, for the first time in two beautifully bound collectible hardcover volumes, are all eight Little House novels, plus the posthumous novella The First Four Years and four rare autobiographical pieces. Am I reading it correctly, that all 8 books will be bound in TWO hard cover books? If so, that is probably a pretty good price. Years ago, Sam's Club had the individual hard cover books for under $12 each. I wish I had gotten them now, but at the time, couldn't afford them. My Josh got me the 5 book set, paperback, but I would like the hardcover set. Would love to put them in the doll case. I love the packaging. I would say that's a fair price too. I have been looking for nice hardcover books of the original series for eons. Why have they never come out with hardcover leatherbound, for each book? I don't get it. There HAS to be huge market for it! All I've found are the original hardcover, usually old library books. Anyway, I found this---I have never seen it before! This is definitely on my Christmas list this year! Yes that's a good price! I paid nearly $80 for that set (Rhonda's pic) when they first came out - so $45 is a great price. I saw a leather-bound set on Ebay last night for nearly $800 - too rich for my blood.